When using email marketing to reach out to your subscriber list, there is a good chance that at least one goal is to increase support of your cause. Most folks on your subscriber list have already supported you in one way or another, but with an effective call-to-action, engaging those subscribers to give more consistently becomes easier. What is a CTA and why does your email need one? “Donate now” – Even before a contact reads through your entire email, they may already be interested in donating. With this CTA, they can quickly find the link to donate and be on their way. With Constant Contact, you can even insert a PayPal link or button to collect donations directly into an email, event-related email, or survey invitation. 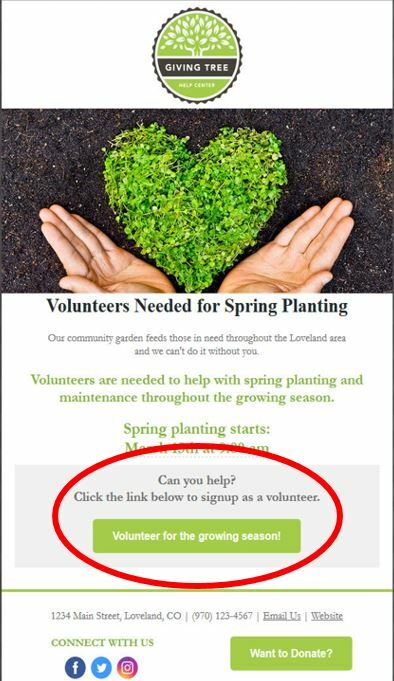 “Sign up to volunteer” – This CTA will attract action from those who know they want to volunteer. Imagine them reading through your email thinking about what they can do to get involved, and becoming excited when they see the CTA with the opportunity to support your organization first-hand. “Learn how you can help” – Though general, this CTA will attract action from people who are looking to support your nonprofit, but may not know how. They will want to weigh their options and learn more about the different ways to get involved. “Inspire change” – Anyone who cares about your cause will want to inspire change. Although this is not a specific action, one can assume that clicking this CTA will provide more information on your cause and how one can become involved. Also, your email text leading up to this CTA should provide enough of a background for the reader wanting to “inspire change”. “Be the difference” – Who doesn’t want to make a difference? Readers will already feel important by clicking on this CTA, knowing that their support will truly be making a difference. “Make the world a better place” – This CTA is emphasizing how important your mission is as well as those people supporting your mission. The idea of changing the world one donation at a time is going to make a strong impact on your readers. “Support a child” – If your organization helps children, show that in your CTAs. The more specific, the better. “Save a pup” – Because animal lovers are a niche audience (and a large one at that! ), using that information in your CTA will target that audience and catch their attention when they are reading your email. “Plant a forest” – With this CTA, readers will understand exactly where there money or time is going, but they can also visualize a forest being rebuilt. Bonus tip: Use pictures to show the benefits of these donations. A smiling child will always create and emotional experience for the donor, encouraging their support. Sometimes, people prefer you to do all the work for them – which can be a great opportunity when it comes to donations. “Volunteer to plant a rose garden” – Sometimes, just asking someone to “volunteer” leaves supporters guessing. Using a CTA with specifics on the opportunity can help drive supporters’ decision to volunteer. “Sponsor a child for summer camp” – Using a CTA with specifics on the campaign you are running can really spark emotion among donors. Maybe summer camp changed their life and they would be so excited to be able to help a child experience the same. This is something that a simple “Sponsor a child” CTA may not accomplish. Bonus tip: A great way to drive donations for a specific funding campaign is to show how much you have raised already, and more importantly, how much you have left to go. Just remember it’s OK to get specific when it comes to dollar amounts. A great tactic to use when thinking up CTAs is to put the ask in the perspective of the beneficiaries of your cause. This technique works best when pictures are used at the same time. “Send me to camp” – In this example, you can use an image of one of the kids your nonprofit supports at camp. A big smile on a child asking to go to summer camp is a CTA that will drive action. “Find me a home” – Looking at a picture of actual “puppy dog eyes” asking you to help find them a home will certainly stir the emotion needed to make a difference. “Keep me warm this winter” – This example could be used for an organization that helps elderly people heat their homes in the winter. Looking at a picture of an elderly couple snuggled up on the couch enjoying hot cocoa would inspire anyone want to help. When it comes to CTAs, the main goal is to make it easy for supporters to help you while leading them to take an action. You took an action when deciding to start or work for a nonprofit. Your supporters feel the same fulfillment you do when helping your organization succeed.